March 18, 2011 - Less than a month after completing the first flight of the U.S. Navy's X-47B UCAS-Demonstration aircraft, flight test engineers from Northrop Grumman Corporation and the Navy have successfully completed the aircraft's second and third flights. The flights, both conducted at Edwards Air Force Base, mark the beginning of a process called envelope expansion during which the test team will begin proving that the tailless aircraft can perform safely over a broad range of altitudes, air speeds and operating weights. "Conducting two flights of a brand new type of aircraft within one week, and both within a month of first flight speaks not only to the robust design of the X-47B aircraft, but also to the dedication and engineering skills of the joint UCAS-D flight test team," said Janis Pamiljans, vice president for the Navy UCAS program for Northrop Grumman's Aerospace Systems sector. "These flights continue to add momentum to the team's march toward demonstrating in 2013 that we can safely operate this tailless, low-observable-relevant air system on a Navy aircraft carrier." 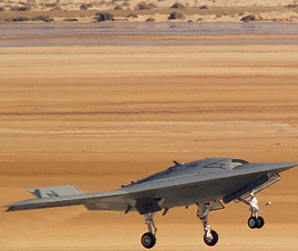 The flight tests also confirmed that the X-47B's flush mounted air data system ? a nod to its low-observable-relevant design ? is accurately sensing and communicating the aircraft's air speed, a critical factor in takeoff and landing.